I have tons of these against the back of the house. I can't reach them right now, but if they are weeds, I'll make sure they get pulled up. Sorry, Harli, I think they are weeds. Not a very easy photo as they are in shade, but pretty sure. If so, they get a fuzzy top of seedheads and blow away all over your garden! Do they go to have dandelion clock type seed heads? 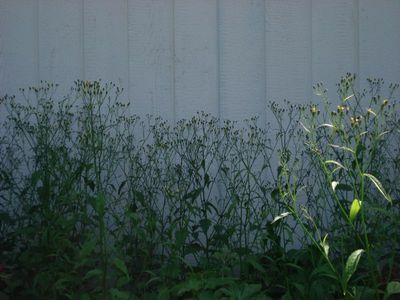 If so they are a weed and pull them up before they go to seed otherwise they will be all over the place.